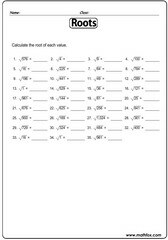 Exponents, powers scientific notations activities, introduction to exponents, numbers to 1st power, 2nd power, 3rd power, 4th power, 5th power, standard forms. 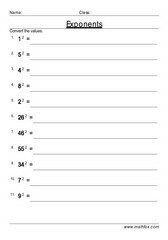 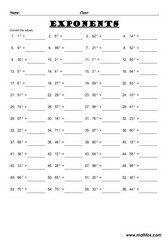 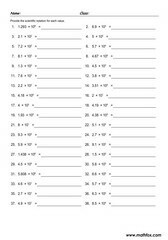 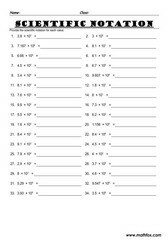 Exponents, powers scientific notations activities - math worksheets, games, quizzes, tests, PowerPoint games, board games, card games . Resources cover the following powers and exponents topics: introduction to exponents, numbers to 1st power, 2nd power, 3rd power, 4th power, 5th power, standard forms etc. 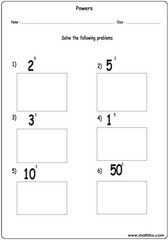 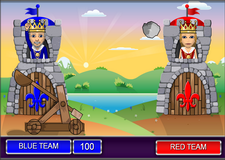 Powers - exponents resources for children in the following grades : 6th grade and 7th grade.